The Green Star/Green Life fruit attachment looks identical to the outlet adjusting knob that comes with the Green Life Juicer except it has a dark green tip. 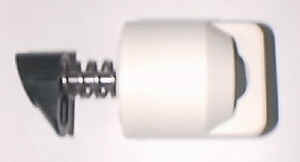 The Fruit attachment has a softer spring rate than the standard outlet adjusting knob. This lets the soft pulp of fruits come out of the machine, instead of getting stuck and backing up the machine. Other twin gear juicers will not juice fruits well (or at all). The green life will do a satisfactory job with fruits with this attachment. (The Green Life Juicer is NOT reccomended if you want to juice MOSTLY fruits, it is BEST for juicing MOSTLY vegetables and some fruit) The Fruits that can be juiced with this attachment are fruits such as: Apples, Pears, Oranges and Kiwi's. This fruit attachment will work with the Green Life and the Green Star juicers. Please note: The Green Life Fruit Attachment will not work with the Green Power Machine. The fruit attachment for the Green Power is available here.